landscapes, which amaze at any time of the year. A destination that must be a fundamental step in a stay in this unique land is Otranto. The most eastern municipality of Italy always arouses attention in the eyes of those who remain amazed to see the crystalline waters from the promenade that is full of lovers of the place. hes all the aspects that love who is looking for the discovery of new cultures. Otranto was first a Greek-Messapian and Roman, then Byzantine and later in the centuries, Aragonese, all cultures that left indelible marks for the village. Thanks to all these testimonies, to the archiepiscopal see, to the tourist flow that every one has received, it has been recognized by UNESCO as Cultural Heritage, returning to the most beautiful villages in Italy. The Cathedral of Santa Maria Annunziata is the most famous place of worship in the country and the surrounding area thanks to its structure so rich in testimonies, and unfortunately over the centuries some have been destroyed by the Turkish invasions, others have been handed down to the days our. The Cathedral is a mixture of different styles: Byzantine, Paleochristian, Roman. In the 15th century, however, the cathedral was the protagonist of a terrible attack by the Turks who, after settling in the city, entered the Church and exterminated all the present civil and clergy who had taken refuge inside, was converted into a mosque and many were destroyed frescos from the previous century. After the liberation of Otranto by the Aragonese, the Cathedral was energetically restored. In fact, the rosette of the façade and the Baroque portal belong to this period. The interior, however, has three naves divided by fourteen imposing granite columns, an arch and a wooden ceiling. The remaining frescoes represent traces of Byzantine culture. In the right aisle you can see the Chapel of the Martyrs in which are preserved the mortal remains of the holy martyrs of Otranto, the inhabitants of Otranto who were tortured and killed by the Turks, because they were Christians. But the part that most fascinates its visitors and art scholars is its floor mosaic that develops on the floor covering the aisles. The representation is a sort of story of a story that is quite fascinating and full of mystery. The Tree of Life depicted with so many tiny pieces of colored glass goes back to what has been the origin of humanity, from original sin to salvation, with scenes taken from the Old Testament. Not just history, Otranto is an eclectic village, full of resources to be discovered, like the sea. The Gulf of Otranto, which separates Italy from Albania, meets the two seas, the Adriatic and the Ionian and retains all the characteristics and beauty of a pristine, pure, crystalline sea. 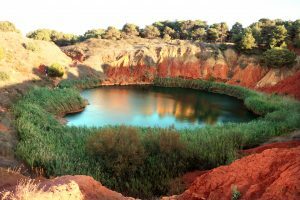 With coasts alternating sand with rocky stacks on which you can admire the fragrant Mediterranean scrub, and the hidden bays in some points of the town, where you can take refuge when you want to escape without going too far, but with the same tranquility of a ‘desert island. And when night falls you can admire breathtaking sunsets. Watch the last rays of sun that disappear behind the horizon and the lights of the city that slowly, one by one light up and illuminate the village, it will be a priceless and unquantifiable emotion. And lying on the beach with the sea breeze in my hair and the smell of the sea that intoxicates the senses, many said to be in ecstasy. A nature that emanates everything it has to offer in the eyes of those who can grasp the simplicity of a seagull in the harbor, a wave that crashes on the beach, the buzz of passersby on the waterfront. And when the evening has come down, the city is inflamed, the many clubs in the city center and along the promenade in the historic center are lit up for a party, and full of lights and lots of music, live and not, will meet all ages, who wants to have fun, who is for a romantic walk, who is a lover of the genre and who simply in the company of friends spend an evening in pleasant company, the company of a village that never goes out, even in winter. 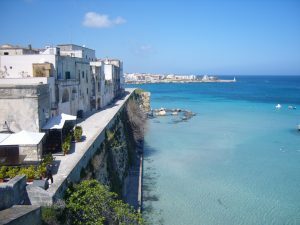 In fact, for those who admire Otranto in the winter months, they will realize that it is anything but a “dead” country. The grayness of the sky that is reflected in the water and that characteristic scent that rises from the sea will make it interesting to go around the streets even when the temperature is less hot. Many details can be grasped when everything is quieter, the slightest indistinguishable signs of the small village are strengthened by winter and give those who immerse themselves heart and soul to discover Otranto interesting stories.